Photo courtesy of College Court Report, the official one-stop site for all things college basketball. Don't know who Dequon Miller is? Learn about the "jazzy junior's" journey to stardom as a Missouri State Bear. It was the fall of 2011, and now Missouri State superstar Dequon Miller was getting ready for what would be his senior season at George Washington High School in Charleston, West Virginia. Miller, a two year double-digit contributor on varsity and All-Mountain State Athletic Conference selection in 2010, was bound to have a fantastic final season that would propel him into an athletic scholarship at the collegiate level. Then, the train was derailed. Admitting he was "immature" and becoming involved in "some of-the-court stuff," the point guard with the potential to play D-1 was told he would not be suiting up for the George Washington Patriots. How could the 5'10" "Swiss army knife" that averaged 14 points and 5.2 assists per game as a sophomore, not be on the team for his senior season. I personally do not know. But I do believe Miller not playing basketball his senior year made him a stronger person and player in the long run. Later denied eligibility when transferring to Capital High School, the fate of his last high school campaign was sealed. But not his career. Utilizing an opportunity to play at Shooting 4 Greatness Academy in Raleigh, North Carolina, the playmaker found mental maturity in route to averaging 28 points and 8 assists per contest; good enough to earn him scholarships at low-majors. However, it was not at the levels of Division I, II or III, that Miller would make a name for himself and eventually take the road to Springfield, Missouri. Tullahoma, Tennessee, a town of about 19,000 people, is where Dequon Miller took his explosive talent to Motlow State Community College, home of the Bucks. As the first recruit by Motlow State's new head coach Matt Sligh, the Charleston, West Virginia native was given the reigns to the offense and thrived in the role. In fact, in his freshman season, Miller was an NJCAA honorable mention All-American as well as a first teamer in his conference with 20.9 points, 3.1 rebounds, 7 assists, and 1.9 steals per game. Talk about a stat-sheet stuffer! In his second collegiate season, the leading scorer for the Bucks still posted 19.0 points per game, but also worked to improve and showcase the other dynamics of his skill. How? Miller's rebounds, assists, steals, and even blocks per contest, all soared to new heights (6.1 rebounds, 9.0 assists, and 2.6 steals). However, when Motlow State was ousted in the conference semi-finals by Columbia State (Miller finished with a near triple-double of 29 points, 10 rebounds, and 8 assists), the question emerged "Where would Dequon take his talents to next?" With serious interest from Missouri, Tennessee, and Washington State, Dequon Miller had a tough decision ahead of him. Or maybe it wasn't that tough. The Missouri State Bears of the Missouri Valley Conference had a very tough 2014-2015 season. Favorited as one of the top challengers to the notorious Wichita State Shockers, Paul Lusk's squad had a season filled of losses, including "losing," via a mid-season transfer, the team's best player and 20-point scorer Marcus Marshall. Though, even with the horrid campaign they had the same time as Miller's great sophomore season, they had held back their interest since power conference schools were partaking in the "Dequon Miller race." Yet, when they approached the 5'10" point guard after his last Motlow State appearance and explained the departure of their top scorer and the plans for Miller to become the new star, Dequon was immediately interested. "He came down to my house and showed me how he was going to let me play in his offense. He was going to let me get up and down the floor, take shots. He wanted me to score the basketball and get other people involved. Basically, what I did at Motlow, that's what he wanted me to do. Get others involved and score the basketball." ---Dequon Miller on Missouri State head coach Paul Lusk's home visit. Thus, Washington State and Tennessee became smaller dots in the distance for Miller while Missouri State was close on the horizon. Furthermore, and to make it official, when his college commitment was announced on March 13, Missouri State had themselves a bona fide point guard capable of anything. Originally struggling to adjust to Division I competition (as all JUCO transfers), Miller had a tough time putting the "biscuit in the basket," for he averaged only 8.7 points with 2.5 rebounds, and 3.3 assists per game in his first six. But, that all changed on December 5 at Oklahoma State. Facing off against a perennial NCAA Tournament team, Miller showed the nation what he could do. From downtown? He drilled three on the day! Taking the ball to the rim? He went among the trees and finished! In other words, Dequon was on fire! And then he ended it. Driving to the basket and firing a game-winning attempt, Miller banked a layup with .7 left on the clock. Now it was TAX Season. From the upset in Stillwater, the JUCO transfer reeled off seven consecutive double-digit performances before striking again with a game-winner at home versus Northern Iowa. Despite hitting a rough patch against Bradley, Miller showed why he is bound to receive the 2015-2016 Missouri Valley Conference Newcomer of the Year award by netting 22 plus points three times in a four game stretch, in which the Bears went 2-2. So in summation, Dequon Miller, a 21-year old superstar and future 2015-2016 MVC Newcomer of the Year, has not taken the interstate to becoming one of the most underrated but BEST point guards in all of college basketball. Moreover, he has taken the road less traveled. And although there has been trials and tribulations early on, he learned from his mistakes while strengthening his faith. 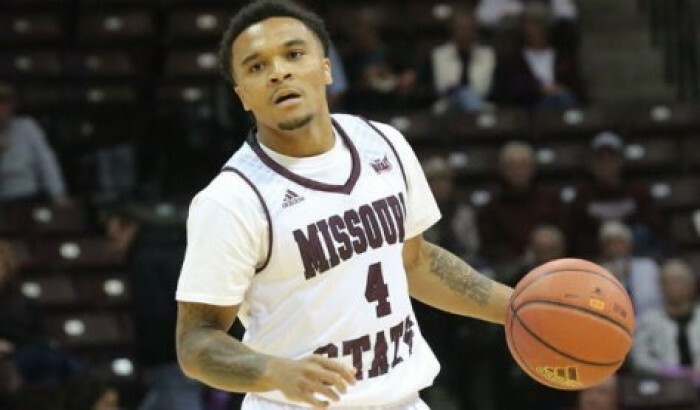 Make sure not to miss Dequon Miller and the Missouri State Bears in action against the Evansville Purple Aces today. VAVEL USA will have full post-game coverage live from the Ford Center.